How about a mouth-watering, antioxidant-filled breakfast that's guaranteed to make your tastebuds smile? Here you go! Breakfast is my favorite meal of the day, and I'm always looking for new recipes to whip up—especially for the weekend when I have more time and can enjoy a leisurely meal. Of course, as a dietitian, I love to create recipes that are as good for your health as they are tasty! 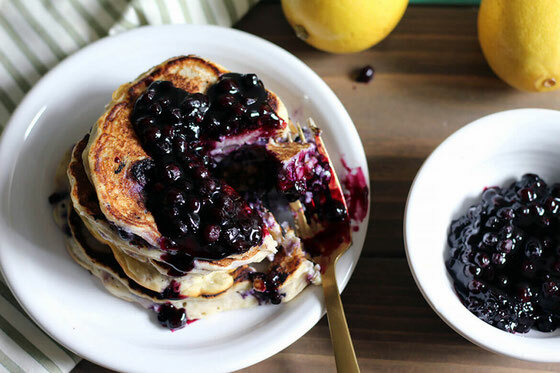 I've been wanting to create a ricotta pancake recipe for awhile now, and what better way to sweeten them than with antioxidant-filled wild blueberries? 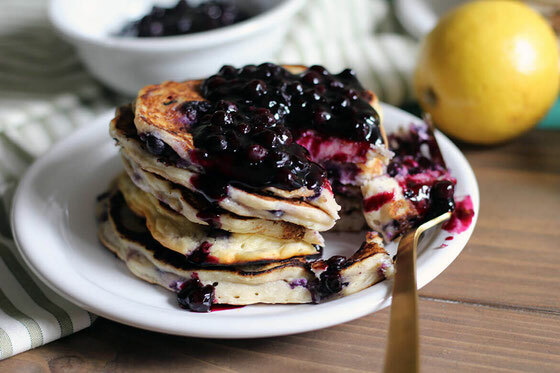 Are you already a fan of wild blueberries? I cook with them a lot, and recently I've whipped up vanilla-iced wild blueberry mini cakes and a wild blueberry peanut butter smoothie. Wild blueberries offer more than twice the antioxidants of cultivated blueberries, and they get their blue-purple color from anthocyanins. These are antioxidants that help your health in a number of ways, including helping brain health and even helping to safeguard athletes from illness following intense exercise. 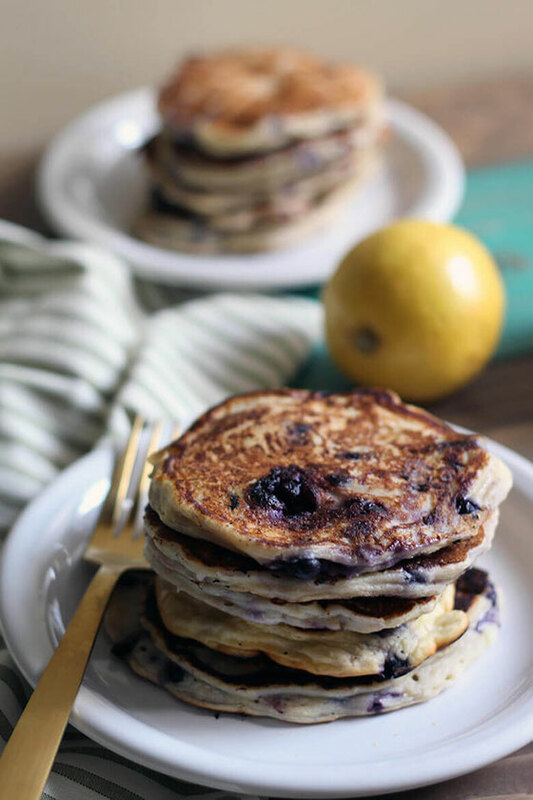 To make these pancakes, I combined part-skim ricotta with lemon juice, wild blueberries, and a few other ingredients. Instead of syrup, I decided to top them off with a wild blueberry sauce. I whipped this up by heating wild blueberries with water and a little sugar and corn starch. If you're curious, this sauce would also taste amazing on top of French toast or even grilled tofu or salmon. 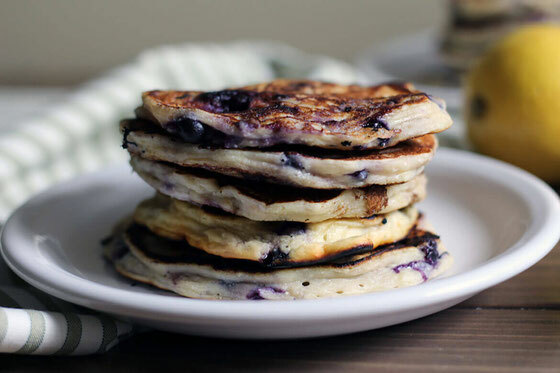 I can't wait to hear if you love these pancakes as much as I do! In a small mixing bowl, combine flour, baking powder, 1 ½ Tablespoons sugar, and salt. In a medium mixing bowl, mix together ricotta, milk, lemon juice, eggs, butter, and vanilla. Add the flour mixture to the ricotta mixture, stirring gently until just combined. Fold in 1 cup of frozen wild blueberries. Heat a griddle or non-stick pan over medium-high heat; coat lightly with spray oil. Using a ¼ cup measure, pour batter onto the hot griddle. Cook the pancakes until the undersides are golden; flip and cook until other side is golden. Repeat with the remaining pancakes. Meanwhile, in a medium saucepan, combine remaining frozen wild blueberries with water and remaining sugar. Heat over medium-high heat, and bring to a low boil. Stir in cornstarch; turn heat down to medium and simmer for 3-4 minutes, stirring constantly, until sauce thickens to desired consistency. If sauce gets too thick, one Tablespoon water at a time. Serve sauce over pancakes. Makes 18 pancakes. What are your thoughts on this topic? What are your healthier go-to breakfast and brunch recipes?